+$If you're searching for a new computer for graphic design, you're in the right place. Creating great work is all about having the right skills. But it also helps to have a machine with sufficient specs – making it faster to produce designs that will please your clients and take pride of place in your portfolio. There's a lot of choice out there, though, which is why we've put together this guide. +$There’s a small caveat for Apple users. As of early 2019, the iMac is nearing two years since its last update, meaning a new model is (probably) imminent. It may surface at Apple’s predicted March event, or WWDC in June, no doubt with an updated processor that will most definitely mean better graphic design performance. So it’s no longer top of out list. If you’re considering an iMac desktop for graphic design, we’d suggest waiting just a bit longer. 微软的Surface Studio 2+$now takes occupies the top slot as the best computer for graphic design. 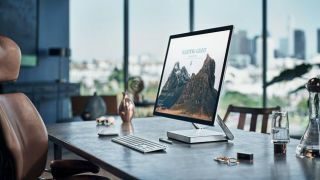 As a fierce rival to Apple’s iMac (number 2 on our list), which badly needs an update, the Surface Studio 2 is an all-in-one that can do a few things the iMac cannot. Its high resolution 28-inch display (4,500 x 3,000) is touch-sensitive, which means it can be used like a giant graphics tablet when you lay it down flat using the hinge at the back. Although Microsoft is still using an older quad-core processor, the rest of the Surface Studio packs a mean punch. Nvidia GeForce GTX 1060 or 1070 graphics card options can deliver some excellent performance too, and there’s up to 2TB of SSD storage and 32GB of memory available. +$The 2017 refresh of Apple’s classic21.5英寸iMac+$still ranks highly in our list of best computers for graphic design, but it's no longer in the top spot. That's mainly because it was strangely left out of Apple’s round of 2018 hardware updates, and the most current version is now two years old. It is a superb machine for graphic design, but it now has outdated technology, limited to 7th-generation Intel quad-core processors, and the AMD graphics card is ageing worse than Keith Richards. An update is surely imminent. We’d recommend holding fire until Apple launches a new model this year, or looking towards Apple’s other, more powerful desktops. The+$Mac Mini+$(number 4) now outperforms the iMac, and if your budget can stretch to it, theIMac Pro+$is a powerful thing indeed. +$It's hard not to be wowed when you first lay eyes on the monumental 34-inch curved screen of the+$HP Envy All-in-one+$. The ultra-wide QHD (3,440 x 1,440 pixel) LED backlit Micro Edge display is unlike pretty much anything else you'll currently see on the shelves. It's an astonishing amount of room to let your creations breathe, and displays plenty of screen furniture to let you make edits and changes with the utmost convenience. It's like having a dual display, but without the clunky hardware. It's pretty nice for watching films and TV box-sets on your downtime, too. Inside there's 8GB of RAM, a quad-core seventh generation Intel Core i7 processor and a 256GB SSD + 1TB HDD combination hard drive. This is a top spec for your cash. 该+$Mac Mini+$is back, in exactly the same small desktop form factor, but now sporting an optional six-core Intel processor that is certain to deliver outstanding Photoshop and Lightroom performance, actually outpacing Apple’s current desktop iMac. Unlike the all-in-ones in this list, you’ll need to connect an external display via the HDMI or Thunderbolt 3 connector. Higher tier storage options are typically astronomical, but you can keep costs down by opting for a modest internal storage capacity (512GB or so) and then using a fast external USB or Thunderbolt hard drive array for your biggest media files. The Mac mini is now the most affordable entry point to owning a Mac. 该Aspire S24+$is a gorgeous looking all-in-one that can handle the rigour of graphic design work, but carries a slightly smaller price tag than the competition. The key is the inclusion of an eighth-generation Intel quad-core processor across the range, which will certainly cope well with design software tasks, from editing video and animations to processing complex high resolution images with multiple layers and filters. It has a 1080p, full HD IPS display that carries tiny bezels and is just 6mm thick, with the computer housed in the base, using a very attractive gold and black design that will really stand out on your desk. And as an all-in-one, it has everything a graphic designer will need right out of the box. +$Let's be clear: this computer isn't necessary for most of us. The majority of graphic designers simply don't need this amount of power in a machine – and the cost is astronomical. But there's a reason why Apple's newest powerhouse workstation, theIMac Pro+$, is so darn expensive – in fact, there are several. And if you're one of the minority of professional users that need this level of power, and can afford the price tag, this is currently the best machine on the market. +$Our final pick in our guide to the best computers for graphic designers is the+$Dell Inspiron 27 7000+$. Dell’s Inspiron line has long been a favourite for Windows-based graphic designers, as they’re not just well built and well specced, but relatively well priced as well. In fact, for less than you pay for an iMac, you can get better graphic design performance, along with that 'Infinity Edge' 4K display, that has almost non-existent bezels. Even the configuration equipped with an 8-core Ryzen 7 1700 processor and likely to chew through design applications with ease is relatively affordable, plus there’s an 8GB AMD Radeon graphics card in there too. This is a great choice that doesn’t compromise on quality.